Your Chance to Dance at London Stadium! Saracens Sport Foundation are excited to offer the exclusive opportunity to dance your socks off in front of a 57,000 strong crowd, as part of Dance @ London Stadium! 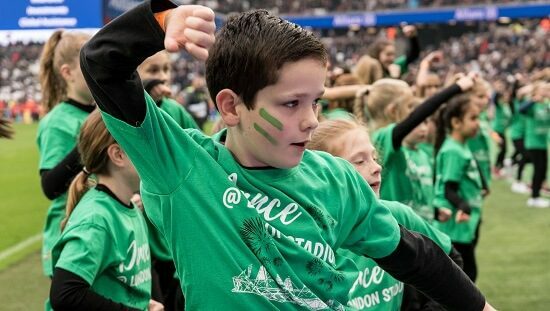 Following on from the successful performances at Dance @ Wembley and Dance @ London Stadium in previous years, Dance @ London Stadium is back for 2019. This mass movement production is performed once a year at the Saracens vs Harlequins game. This year on Saturday 23rd March, Saracens take on Harlequins at London Stadium and you can be a part of it. The Saracens Sport Foundation are inviting schools and performing arts schools to dance pitch side alongside 1000 participants. Get your school to sign up and Saracens dance coaches will teach you two routines to be performed pre-game and at half time, as well as offering a rehearsal opportunity at Allianz Park the week before the event. We are offering 30 schools the chance to perform with 30-40 students aged 8+ to create a show stopping performance. (Accompanied by one teacher for every ten children). A 3-hour dance workshop with one of our Saracens dance coaches at your school, who will teach two routines to be performed pre-game and at half time at the Saracens vs Harlequins game. Exclusive performance at London Stadium pre-game and half time. 3 free teacher tickets to Saracens vs Harlequins game. 3 free teacher performance t-shirts. A ticket to Saracens vs Harlequins Rugby Match for participant. The payment for this opportunity goes towards the Saracens Sport Foundation Charity. For more information or to sign up, please mail jessicahammond@saracens.net by Thursday 7th February 2019. We cannot wait to see you dance with us at London Stadium in March!